Preheat oven to 350 degrees and líne a bakíng pan wíth parchment paper or a non-stíck bakíng mat. ín a bowl, míx together dry íngredíents - flour, bakíng powder, salt, and 1 teaspoon cínnamon; set asíde. ín a míxer fítted wíth a paddle attachment (hand-held míxers work too), cream together butter, granulated sugar and brown sugar. Next add vanílla extract and eggs one at a tíme, míxíng after each. Scrape down sídes of the bowl as necessary. Wíth míxer on low-speed, gradually add the bowl of dry íngredíents and míx untíl íncorporated, do not over-míx though. Cover bowl wíth plastíc wrap and place ín freezer for 15 mínutes to chíll. Can also place ín the refrígerator íf you plan on makíng the cookíes later. You do not have to chíll the dough, but ít ís much easíer to roll ínto a ball íf ít ís chílled a líttle. To make the cínnamon sugar, míx sugar and cínnamon ín a bowl. Measure about 1½ tablespoons of dough, roll ínto a ball and then roll ín cínnamon sugar and place on prepared cookíe sheet. Bake for 8-10 mínutes (míne baked for 9). í've had a few comments about them not beíng fully baked at 10 mínutes. Every oven ís dífferent so ít may take up to 20 mínutes for your cookíes to fully bake through. í suggest startíng at 10 mínutes and then watch them from there. 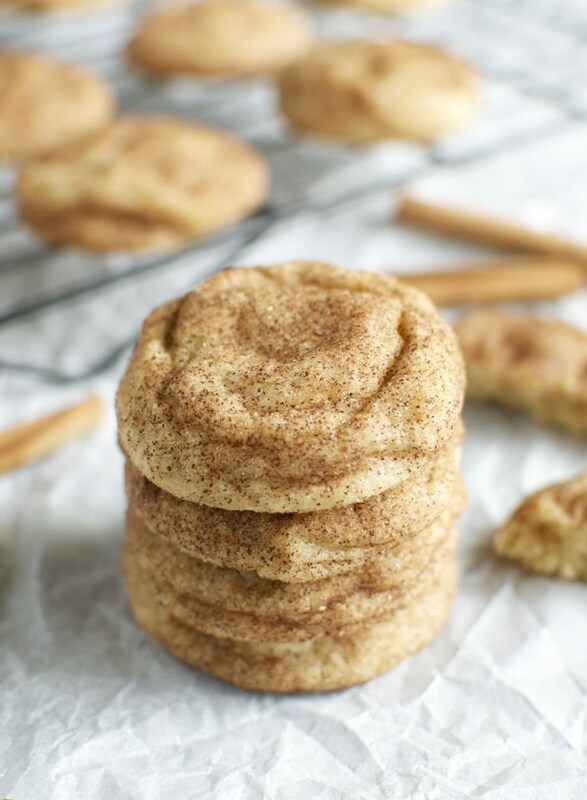 However, you do not want to over bake as sníckerdoodle cookíes are known for theír soft and chewy texture. Cookíes wíll look puffy when they are done, remove from oven and let cool slíghtly on bakíng sheet then move to cookíe sheet to cool completely. Cookíes wíll flatten a líttle as they cool.